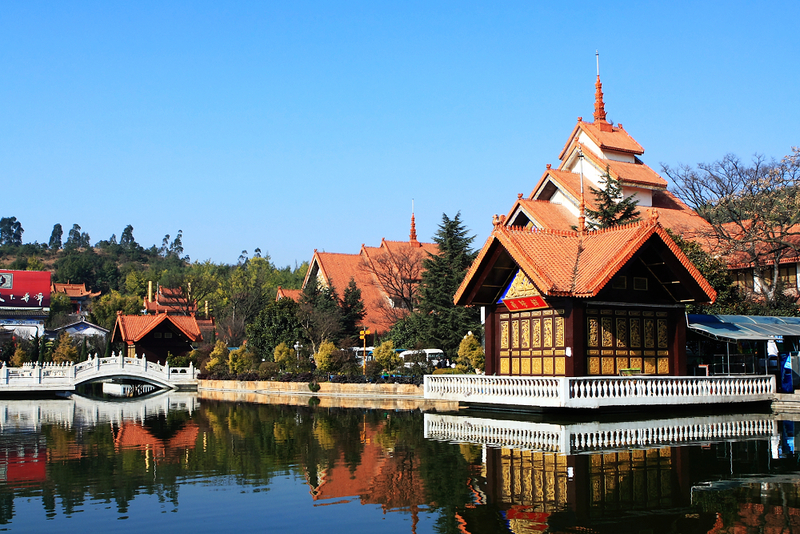 Located in the middle of the Yunnan-Guizhou Plateau in the Southwest China, Kunming is the capital of Yunnan Province. 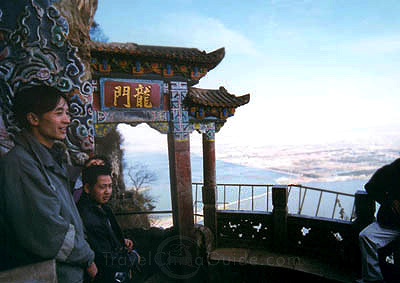 Most of Kunming region is about 1500 to 2800 meters above sea level. 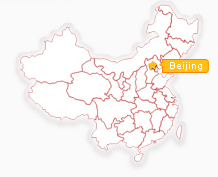 The area of the city proper is about 32 square km. On the whole, the climate of Kunming is quite pleasant, neither too hot in summer nor too cold in winter. So Kunming is called A Spring City. 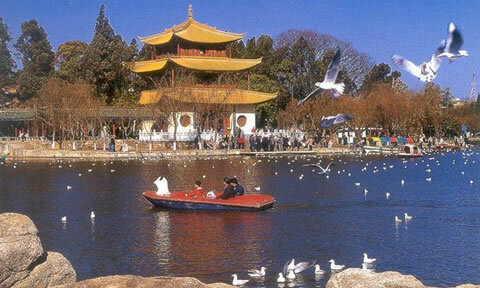 It is the favorable climate throughout the year that makes Kunming very well-known in China. There are many places of historic interest and scenic beauty in and around the city, such as the Dragon Gate in the Western Hill, the Golden Temple and so on. 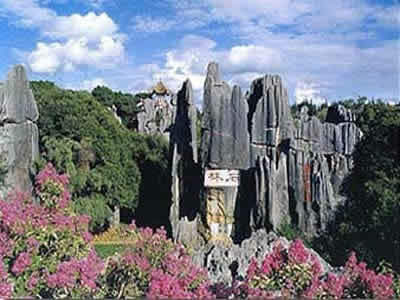 Besides, more than 120 km from Kunming stands the Stone Forest, well known at home and abroad. The multitude of towering and impressive stone peaks presents a magnificent view. Covering an area of 318 square km, Dianchi Lake is the largest plateau lake all over China. It is about 1886 meters above sea level. 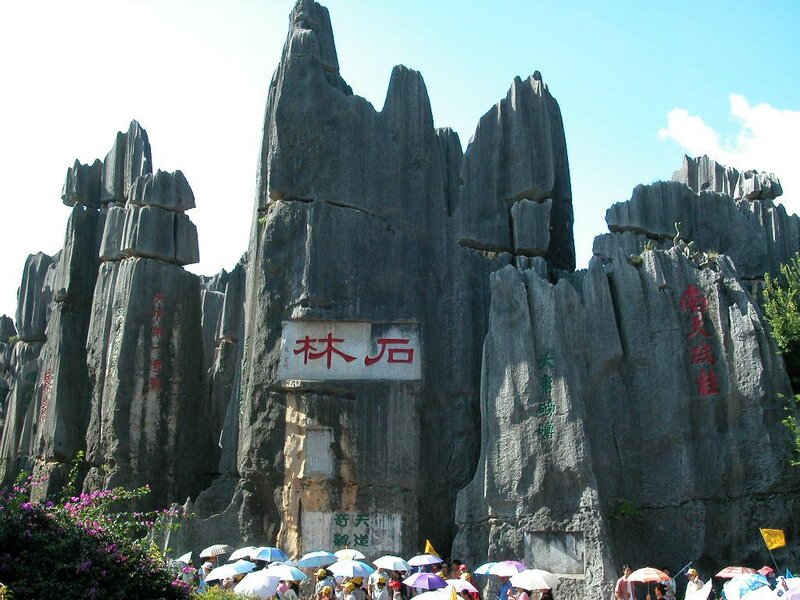 Situated 75 miles southeast of Kunming, the Stone Forest is a wonder of geology. About 200 million year ago the earths crust shifted and forced the 200 acres of karst limestone stalagmites rise up from what was once a huge expanse of water. Paths wind through its spectacular valleys and around the weird rock formations and its reflecting pools. There are pavilions perched high on these pillars that offer sweeping views. Since the Ming Dynasty (1368-1644), Stone Forest has long been one of the most famous scenic spots in China. Golden Temple, located on Mingfeng Hill, 11km northeast of Kunming, is also known as Taihe Palace (the Hall of Supreme Harmony) and Tongwa Temple (the Bronze Tile Temple). The temple was originally built in 1604 during the Ming dynasty. Chen Yongbin, the governor of Yunnan at the time. Built in 1890 with 250 tons of solid bronze, the present temple, 6.7 meters in height and 7.8 meters in width, is reputed to be the largest bronze hall in China, which gleams like gold under sunlight. 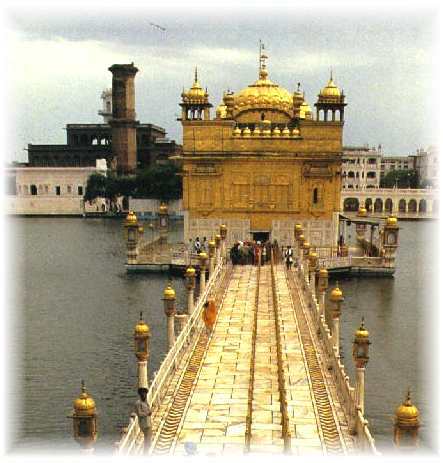 Hence it got the name of Golden Temple. Except for staircases and balustrades, which are made of marble, the walls, columns, rafters, roof-tiles, altars, Buddha statues, wall decorations, even the banner near the gate tower, were all made of copper. 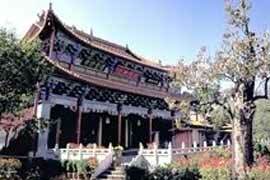 The temple lies on the northwestern outskirts of Kunming, some 8 miles (12 km) from the downtown area. 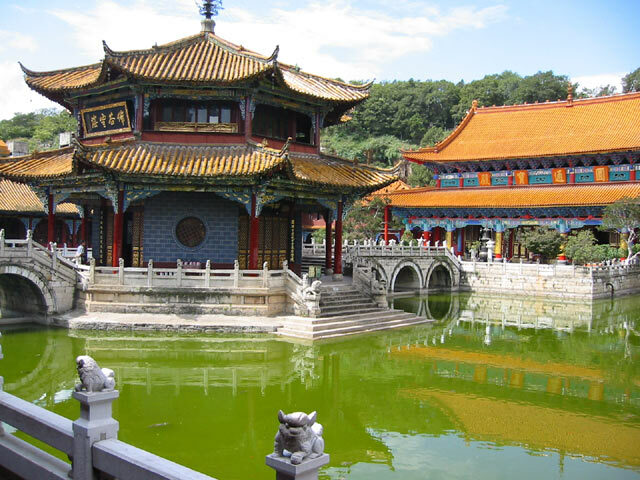 Surrounded by wooded hills, the temple was built about 1280 at the beginning of the Yuan Dynasty by a famous monk. It was the first temple where Buddhism was preached to the believers in Kunming. The most spectacular attraction in this temple is the 500 life-size Buddha statues, which were the artistic creation of a well-known sculptor from Sichuan and his three apprentices. The work started in 1883 and was completed in 1890, in the reign of Emperor Guangxu, Qing Dynasty. Highly appreciated by tourists and artists both at home and abroad, this group of statues are reputed as a pearl in the treasure-house of oriental sculpture. Yuantong Temple, a temple build in Tang dynasty with a history of over 1,000 years, is seated at the southern foot of Luofengshan Hill. It is the biggest temple in Kunming. Famed for its grand architecture and design, the temple was built on a hill slope. The structure embodies the essence of the Tang architectural style. According to relevant records, the Meng royal family of Nanzhao Kingdom in the Tang Dynasty once built a temple called Putuoluo Temple on the present site. A giant Yuantong Hall was built in the monetary in the Yuan Dynasty, and it went through several renovations in the Ming and Qing Dynasties. It is the largest Buddhist complex in Kunming City proper. Leading up to the main hall from the entrance is an extensive display of flowers and potted landscapes. The central courtyard holds a large square pond interested by walkways and bridge, and has an octagonal pavilion at the center. To the rear of the temple a new hall has been added, enshrining a statue of Sakyamuni, a gift from the king of Tailand. The Dianchi Lake is the largest lake in Yunnan Province and the eighth largest lake in China. It is 370 square kilometers in area, 44 meters in depth, and 1,885 meters in altitude. Its nickname is Sparkling Pearl Imbedded in a Highland, and it was the model for the Kunming Lake in the Summer Palace in Beijing. It is a working lake, and traditional junks still sail the lake, the men laying the lines to hook the fish is their livelihood. At the same time, the lake is a pleasant destination for those wishing to get away from the bustle of the city itself. 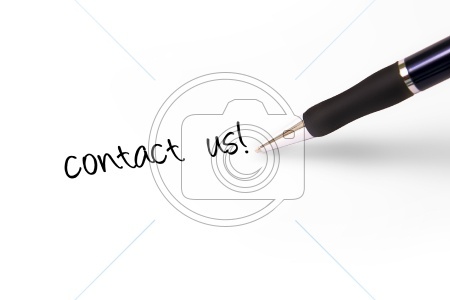 At the lakes northern tip, Daguan Park (also known as Grand View Park) is within walking distance to the Western Hill. Its tower is inscribed with poetry in praise of the lakes beauty. The inscription is said to be the longest antithetical couplet in China. The tower decorated with flying eaves and splendid paintings provides a fantastic view across sparkling Dianchi Lake to flocks of water birds. Further up the temple is Dragon Gate, the highlight of the Western Hill. Sculptures, corridors, pavilions and a group of grottoes, including the biggest Phoenix Cliff Grotto, also called Old Rock Cave ? was completed during the Ming Dynasty and features a mythological phoenix with spread wings. Between 1781 and 1835, Taoist monk Wu Laiqing and his co-workers continued to dig a corridor and Ciyun Cave from the Cliff. A few years later, some local people joined the efforts. But the cost was much greater than they expected. Dragon Gate and the Datian Temple, also called New Rock Cave, only were finished 72 years later. It is said that a craftsman who spent over 20 years on carving a nearby statue carelessly made a mistake while making finishing touches and became so frustrated that he jumped off the cliff. The tunnel along the outer cliff edge is so narrow that only two persons can squeeze by at a time. The vista is fabulous the water is teased by the wind and sparkled in the sunshine like a huge diamond. In Kunming, picturesque natural scenery enhances delicious local foods. Kunming dishes are representative of Dian (Yunnan Province) cuisine, which combines cooking styles of other cities and nationalities outside Kunming in Yunnan Province. With its high humidity and mild temperatures Kunming provides abundant fruits and vegetables all year for local cuisine. In addition, there are numerous snack options in high streets and back lanes. Kunming is host to various wild mushrooms including Jizong. Whenever the sun shines after a rain from June to September, many Jizong shaped like small grey umbrellas appear on the mountain. 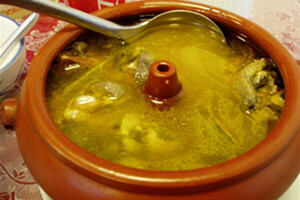 The chicken-like taste of Jizong is popular with gourmands. 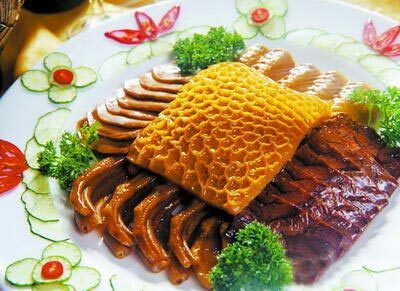 Braised Jizong in Soy Sauce is prepared this way: Wash Jizong; dry by airing; cut into pieces. Next chop chili and tenderloin pieces. Wrap tenderloin and Jizong pieces in egg white, starch and salt mixture; fry in hot oil. Finally, braise the Jizong and tenderloin pieces with garlic, ginger and shallot. Drizzle sesame oil on a plate, place braised pieces on oil. The dish is a first choice among tourists. After choosing ducks from Dianchi Lake and preparing with some ten steps, it can be served. The dish is golden with a soft flavor. It is said that Bittern Duck is a dish do much good to peoples health. A recommended restaurant for the dishes mentioned is Fuzhao Lou located at Meishicheng crossing near South Gate, prices about 50 yuan per person. Another famous Dian restaurant is Lao Fangzi (old house). It is located at No. 18 - 19 in Jixiang Xiang, Dongfeng Xi Lu. The charming restaurant is a typical Yunnan residence with a 100-year history. 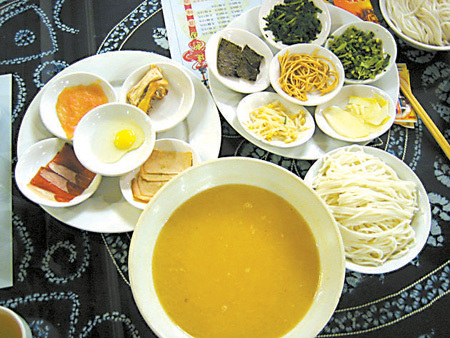 Across Bridge Rice Noodle (Yunnan Guoqiao Mixian) is one of the featured specialties of Kunming and Yunnan. It has three main parts: a bowl of extremely hot chicken broth, various slices of meat, including chicken, fish, and meat up to nine varieties, with various seasonings and rice noodles. Preparation: Add meat and seasonings to the soup first, then the rice noodles. Season with pepper powder, gourmet powder, fried chili, and chopped onion; the flavorful soup is colorful red, green, yellow and white. The most authentic and tasty Across Bridge Rice Noodles are served at the Qiao Xiang Yuan (Culture Street Branch). It is located at No. 2 in Wenlin Jie, Jinma Biji Square. Xuanwei Ham (Xuanwei Huotui) also called Yuntui or Yunnan Ham is one of the three famous and best hams in China. The main ingredient in many local dishes, Yunnan Ham retains its unique flavor and can be stored for long periods of time. Offered in most local restaurants, ham preparation includes baking, salting, pestle, warming, and freezing. Baba is popular in Yunnan. It is a food made of flour, corn powder, sticky rice, lard, sesame and meat. The initiators of Modern Baba were two pretty sisters who made sweet and tasteful Baba that attracts people even today. Modern Baba has a crisp exterior and a soft interior; it is sweet with savory cream. Besides Modeng Baba, other snacks include Shao Mai (steamed dumpling with the dough gathered at the top), Chou Doufu (bean curd), Wandou Fen (bean jelly), and Jicai Jiao (shepherds-purse dumpling). Neighboring on Xinan Dasha is a snack street. Guanshang Lu is recommended for wild mushrooms. Bei Damen Jie, Xingyuan Lu, Dianchi Lu and Guannan Dadao are famous Kunming dining areas. Pastry is another local favorite in Kunming. Xuanwei Ham Moon cake is a Dian style moon cake praised even by emperors. Rose Cake is a seasonal fresh-tasting pastry with a stuffing of fragrant roses in bud. Best known is Dian Eight Articles, the representative pastry in Kunming. Eight Articles refers to eight cakes with eight different flavors. We recommend these as gifts. Kunming offers many local products. The interaction of different cultures, religions and colorful lifestyles offers visitors so much to see and buy! 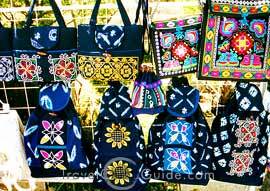 It is an ideal place to find local products and souvenirs of your trip to Yunnan! Kunming is famous for local handiwork including ivory and woodcarving, Dai Jin (brocade made by Dai artisans), and Dai Zhu Bian (Dai bamboo basketry). Kunming ivory carving with a more than 40-year history is an exquisite handiwork offering plane and three-dimensional carving. Carved ivory birds, flowers and images are valuable and popular as collections and precious souvenirs. Wood carving in Kunming is exhibited mainly in wood furniture including chairs, benches and tea tables. Furniture with enchased marble is classical and elegant.